Whatever you do, don't fall asleep watching Blu-rays in April. 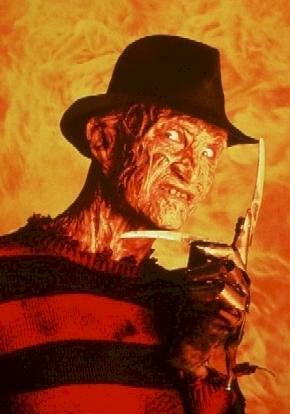 Warner Brothers has slated Wes Craven's 'A Nightmare on Elm Street (1984)' for high-definition treatment on April 6. Specs have yet to be revealed, but supplements will include: Audio commentary with Director Wes Craven, co-stars Heather Langenkamp and John Saxon, and cinematographer Jacques Haitkin; Audio commentary with Wes Craven, co-stars Robert Englund, Heather Langenkamp and Ronee Blakley, producer Robert Shaye and co-producer Sara Risher; Alternate endings; The House That Freddy Built: The Legacy of New Line Horror; Never Sleep Again: The Making of A Nightmare on Elm Street; and Night Terrors: The Origins of Wes Craven's Nightmares. Exclusive to the Blu-ray will be Ready Freddy Focus Points - revealing filmmaking secrets and alternate takes through video highlights during the film. You can find the latest specs for 'A Nightmare on Elm Street (1984)' linked from our Blu-ray Release Schedule, where it's indexed under April 6.